In 1989 I went through Infantry Basic Training at Ft. Jackson, SC. I was sworn in 7 September, and left basic training 14 December and was assigned to Ft. Lewis, near Tacoma, Washington. Basic Training is designed to mold a young man into a soldier. Training is drilled into you by a succession of skilled, task-oriented Drill Sergeants. Each task repeated over and over and over until that one task becomes a response of nature, rather than a ’skill’ you have to stop and remember. If you have to take the time to stop and think, it will be too late, and you’ll become a battlefield statistic. I remember a lot of my days in basic training; the heat, the cold, the commitment, the hard work, and the brothers that were made there. But something else really stands out from those days in basic. The only day off I had was Thanksgiving Day. That was the only day we were granted the privilege of leaving post with a 24 hour Pass. On that day, I sat in the living room of the home of a high school friend of mine, and watched the beginnings of the fall of communism in Eastern Europe. That day CNN was filed with images of the Berlin Wall being crushed, torn asunder, and family members who had been stuck on opposite sides of that wall, emotionally embracing each other after having been separated for nearly 50 years. By 1991, the Soviet Union was officially dissolved, and as a result 14 nations immediately declared their independence. Soon thereafter Yugoslavia was dissolved, and from that communist land emerged five more separate independent states. One such nation was the Croatia, the now free homeland of the talented Domagoj Telisman, the owner of Dotter Pipes. Dotter is a combination of the first few letters of Domagoj’s first and last name. This was a nickname has stuck with him. Domagoj is the artisan behind this pipe you see before you now. In a brief blog post about Domagoj I posted some time ago, it was primarily the attention to detail, and most especially the finish that really drew me to his work. Each piece, whether made from traditional briar or some other material such as olive wood, morta, boxwood, strawberry wood and others, the finishes were exquisite. I was immediately taken by his work and wanted, no, NEEDED to know more. Emails and pleasantries were exchanged between Domagoj and I, and he soon agreed to allow a review. After working around and through his busy schedule, the example was delivered in a small envelope via US Postal service. My mail delivery person is a philatelist (stamp collector) and her interest lies on what’s on the outside of the envelope. I’m far more interested in what’s inside! Figure 1 Notice the tight tolerances and smooth lines between the intersecting parts of the shank (made of bamboo), the accent ring (made of bone), and the bit (made of ebonite). Inside the padded envelope the pipe was housed in a comfortable leather sock. Light tan in color the leather reminded me of deer-skin leather, soft and supple both inside and out. A dual draw-string closure in a gold/tan color was pulled back to reveal the contents. I reached into the sock to gently pull the pipe out, and it slid out easily, and just kept coming, and coming, and coming! The pipe measures 7.125″ long stem to stern. Not a short one to say the least, but every centimeter interesting. Some first impressions of people are very good ones. Others are not. As first impressions go, this was a very good one. For me what matters most is this: Does the first impression give you the desire to know more? This one certainly did. When the pipe had shipped from its home in Croatia, I received an email from Domagoj saying that he had included a “surprise” with the package. To my delight, this pipe also included a custom handmade tamper as well. The tamper is longer than most and made from the same beautiful darkened bamboo as the shank of the pipe. The tip of the tamper is turned brushed aluminum and it looked very nice. A welcomed gift to be sure; both practical and beautiful. The package also included a very colorful and well-made information pamphlet with contact information, company information, and specific details about the pipe he had sent. Essentially, the pipe’s pedigree. Interesting, and very well done I might add. 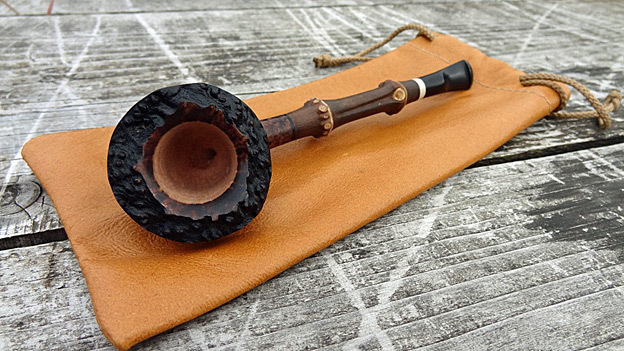 Figure 2 Domagoj created an excellent pipe in this long black, bamboo freehand model. Lightweight and beautiful, it would make any owner proud. I always say that socks are important. They are important not only for the protection of the pipe itself, but also for the grand over-all esthetics of the pipe as a collective ‘package’. This sock worked well both ways. Using a dual draw string system like the one on this sock works well, but with the silken chord provided, you’ll probably want to add a slight knot when securing it, as the chord is naturally sleek and tends to come open otherwise. 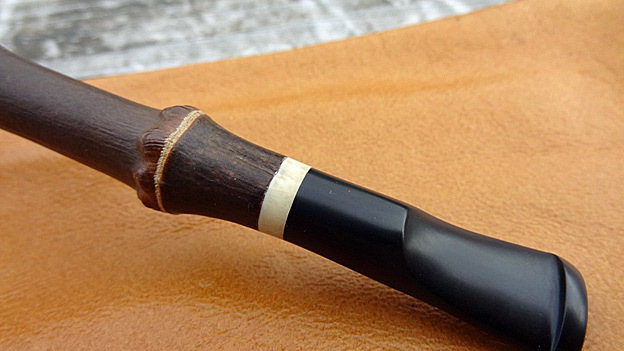 This pipe is a smooth black bamboo straight Freehand, #84 by his keeping. As a finished package, this pipe brings a sophisticated beauty to the eye. While we have all seen pipes with bamboo used in their construction in one form or another, this one seems somewhat unique. While the bamboo is present, it does not become the center-piece to the eye. 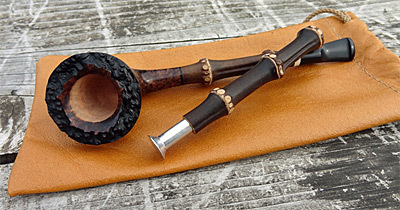 The quality of the briar and the pipe’s overall ‘presence’ IS the show. Figure 3 Notice the smoothness and flow between the bamboo, black acrylic accent washer and the stummel. Also, take a look at how precise the forming is on the briar in order to make the contours of the bamboo flow into the pipe itself. And this pipe flows. Using the eye test, the contours of this pipe are totally fluid. Yet at the same time, every bump or change of material along the way brings contrast – in no way effecting the fact that your mind sees this all as one piece. In that manner, what Domagoj has pulled off is simply amazing. There are no fewer than eight material edges along the pathway from the stummel to the bit, and you are hard pressed to feel, let along see any of them. Figure 4 Another look at the skilful connection of the contoured bamboo meeting, in this case a bone accent ring, and then the fitting of the mouthpiece (stem). The stummel is blessed with an array of straight grain gifted to us by the gods of briar. Thick and strong, these grains give the impression of looking deeply into a dark hardwood forest where the tree trunks run mostly true, but with branches that crisscross along the way as we peer deeper off in the woods. It makes you want to reach out and grab them, but when you do you are halted by the smoothest briar surface one might ever feel. Figure 5 Exciting grain flows north and south on this block of briar. The black stain really releases the structure and flow. I mentioned that one of the things that drew me to Domagoj’s work was the finish of his pipes. They shine like they have been dipped in liquid diamonds in the photos, and are every bit as dazzling in person. This pipe is no exception to that quality but brings more to the table as well. The bowl itself glows with brilliant refractions of just the ambient light, but the rest of this freehand – #84 is in what I’d call a matte (soft) or satin finish. The contract is magnificent. The nature of the bamboo itself is of a soft, non-reflective surface. The carefully sanded root knots are clearly polished but to a satin finish as well. 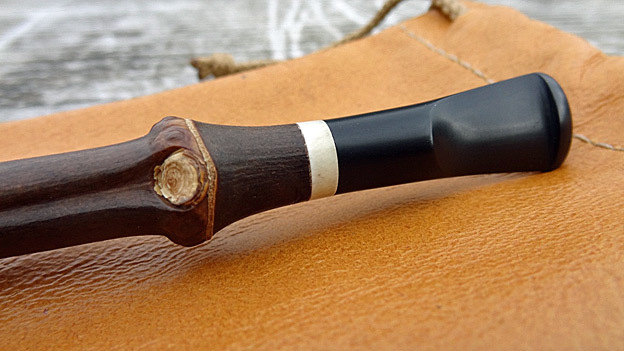 The bamboo shank extends into the mouthpiece, but not before it crosses an accent ring made of deer bone. With a soft sheen to it, the bone ring is followed by an ebonite mouthpiece that pops perfectly against the natural ‘dirty white’ or antique appearance of the bone. The contrast stain is black, and leaves the pipe tone to be opaque but dark. 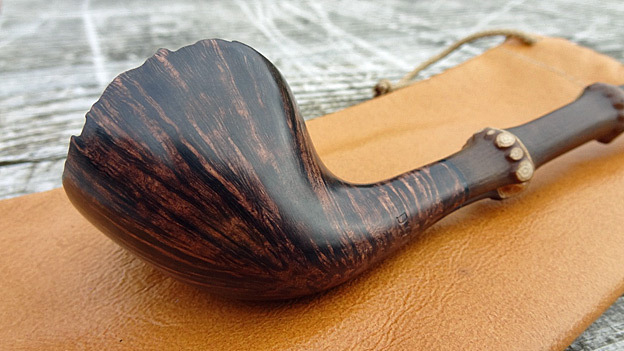 While dark in color, the grain is far from hidden and is one of the most attractive features of this pipe. The contrasted striping in the stummel is exciting. When not reaching vertically to get to the top of the bowl to release themselves into mid-air, the grain wraps around the shank exposing an almost birds-eye section reminiscent of looking down into a bowling caldron. This briar is, if nothing else, very interesting. Figure 6 A clear look at the deer bone accent ring that melds the bamboo shank to the ebonite stem. The bowl finish is as smooth as any I have ever felt. Both inside and out. The straight grains flow upward towards the plateau textured rim topping a thick, strong bowl. The inside of the rim has been contoured and polished making it appear as if someone took a large hot tool and melted it. It is an attractive, almost art-deco/Picasso look which I thoroughly enjoy. 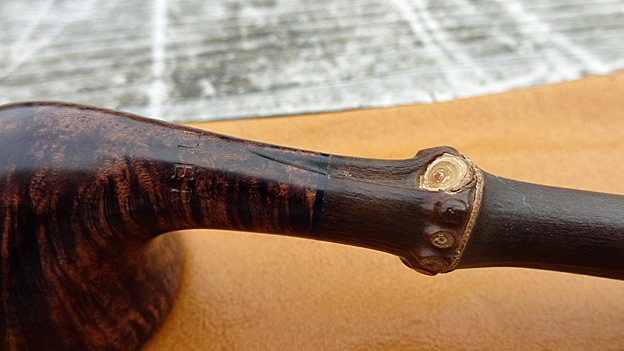 There is of course always something natural and beautiful about the use of plateau texturing on a pipe. These structures are not too deep and smoother than some others I’ve seen. Like some sort of massage therapy, running your fingers over the rim of the bowl is satisfyingly soothing – just as a pipe ought to be. I like the look of a finished pipe with bare wood of tobacco chamber. I like to see that sharp edge where the stained and glossy polished exterior crosses to unstained and bare wood look of interior. Sometimes it is a little bit more work to make this line nice and neat, but for me it is totally worth it! Nowadays, a lot of conversations are going on about bowl coatings, on forums, magazines and blogs. I prefer a bare wood tobacco chamber pipes for my collection, and I like to “raise” (break-in) this pipe in the way I want it. But if I can choose it – uncoated please! Figure 7 I love the look of the natural plateau texturing on the rim of this bowl. The contrast between it and the smoothness of the bowl makes it look like melting chocolate. 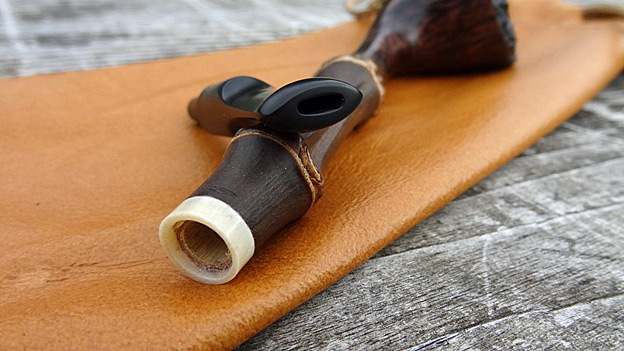 One thing I like to ask the pipe crafters is how this particular pipe came to be. It gives us a window into the soul of the crafter – a glimpse at how the process begins in their creative stages, before tools hit briar for practical application. Allowing the grain to speak the direction it wishes to go may not always produce the desire of the crafters heart, but it almost always produces exquisite pipes that excel at showing off their natural beauty. In the case of the Bamboo Freehand #84 from Dotter pipes, Domagoj’s decision is self-evident success. This pipe is as practical as it is esthetic. The bamboo not only reduces the weight compared to pipes of similar size (especially of this length), but it increases the WOW factor by tenfold. I will often lay my new pipes on my desk at work to see what sort of attention they draw from passersby. This pipe, by far and away, drew the most attention of any new pipe I had put out for all my coworkers to see. My day job is not in the pipe smoking or tobacco industry so I cannot say that the impression it made on the crowd was necessarily a well-informed one, but that is not the point. The point is that this pipe made people stop and ask about it. They wanted to know who made it, what the materials were, and were all equally thrilled and impressed not only with the use of the exotic materials, but with the feel and finish of the product. 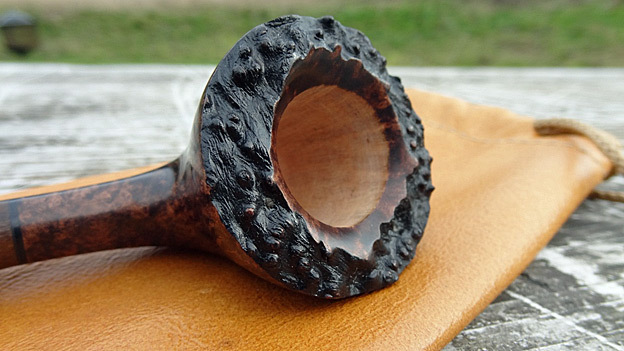 If the goal was to make a pipe that was attractive to people – spot on. This pipe did it in spades. Filling and lighting went without incident. When handling the pipe one does not feel, despite the lightness of the unit, that the pipe is insufficient in mass, nor is it unevenly balanced in the hand. I’m a bigger guy and I like large pipes. They fit well in my hands, and they look appropriate when I’m smoking them. But this long lightweight pipe is as comfortable in the hand as it is in the mouth. The stem is smooth to the touch and has a substantial bit that is equally soft in the mouth. I have had pipes in my collection before that were wonderful pipes, but had bits on the stems that were, for lack of a better term, simply abrasive. This piece is just perfection! It almost feels like the stem and bit are melting in your mouth they are so soft and smooth. 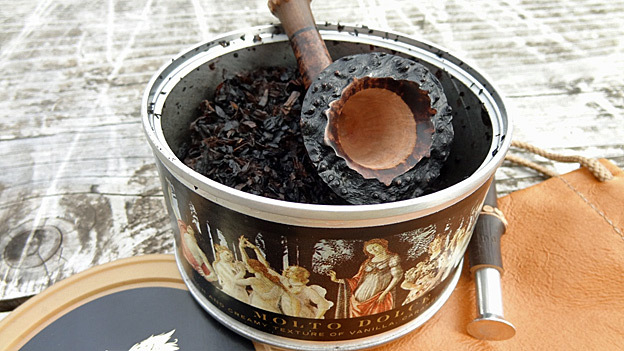 The smoke of the Molto Dolce aromatic from Sutliff Private Stock, despite being moist, rolled through that long bamboo shank, cooling along the way and meeting my palette with loads of flavor and no bite. The cooling benefit to a long shanked pipe I suppose, and it was not lost on this smoker. I have never seen a pipe ‘packaged’ so well. It was exciting to open! Reading the pamphlet about my pipe and the works produced by Dotter pipes was as exciting as smoking it. Seeing the hand-written notes about the pipe from its creator, allows the new owner to bond with the man behind the creation. It’s fun, and it builds relationships that will last and make a difference in the pipe smoking community. I still keep going back to the finishes on the Dotter pipes. Brilliant, deep and honest – in other words, come by through hard work and dedication, not through means of temporary trickery. 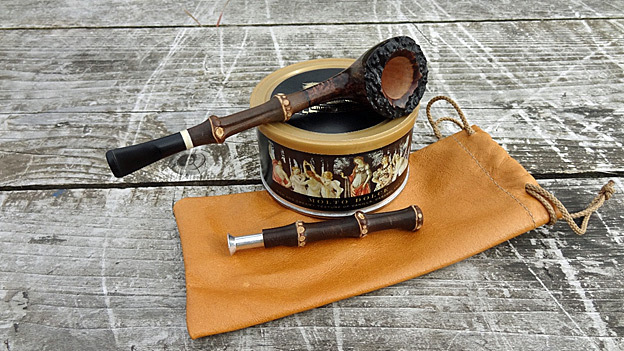 This pipe exemplifies Domagoj’s attention to detail and desire to impress, but went even further by showing that the crafters skills are not just in polishing, but “finishing” the pipe with the best look befitting. Smoking this bamboo beauty was a true pleasure. 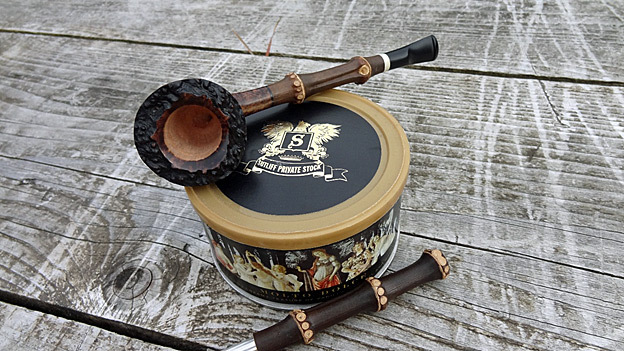 I can only imagine that any customer obtaining a pipe from Dotter Pipes will be equally impressed.